Pennsylvania Dutch buffets in Lancaster are a dime a dozen. Some are plentiful and fresh while others have seen better days. I’ve been coming to Dienner’s since I was a little kid. Over the years, the visits have been numerous but always for breakfast. We finally decided to try the lunch buffet. We had just spent two hours on the road and had not eaten yet. To quickly summarize the breakfast buffet from past visits: the bacon is super lean and crunchy, and the home fries are crisp. Everything is fresh, from the scrambled eggs to the scrapple (this is the only place I’ll eat the sinister looking patties of deep-fried pork byproducts), and even warm shoe-fly pie. That’s pretty much all I have to say. It’s amazing, and for something like $7 it is well worth it and will fill you up for the day. Their lunch buffet also gets a good commendation. 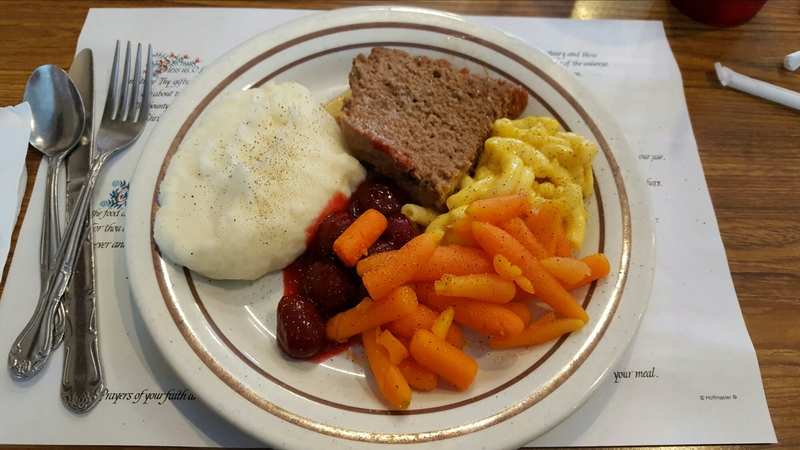 There is an assortment of homemade meatloaf, fresh country ham, rotisserie chicken, and about 10 different vegetables and starches on the side. It also comes with a salad bar, dessert bar, and a fridge full of pie slices. All of this for just over $10. Let’s start with the meatloaf, which was succulent and tender. You could tell it just came out. I also put a heap of mashed potatoes on my plate as well as carrots, beets, and macaroni and cheese. My second helping consisted of some of that ham which was also pretty juicy and not too smoky. I passed on the salad bar and instead went right for the desserts. I was already stuffed, but had to have a look. I think there were four or five kinds of cakes, an equal number of puddings and jellos, a deep dish tray of chocolate molten cake, and that fridge of pie. I went with a little bit of pistachio pudding which was good, and also a scoop of Oreo pudding. This was excellent. So simple: just vanilla pudding and chunks of Oreos. If that wasn’t enough, I also put a tiny sliver of carrot cake on my plate. No matter who you are, you will leave there stuffed. With restaurants starting to get $10 or more for just a sandwich, their $10.65 lunch buffet is more than worth the price. Heck, the dessert bar alone is worth that if you just wanted to come in and snack the afternoon away. Everything was fresh. This is no-frills, simple Mennonite cooking. You’re not going to find anything fancy here. But from this simplicity emanates that warm feeling of home-cooked goodness. This wasn’t just a bunch of hastily prepared garbage slopped for the masses of us “English” tourists. No, this is down-home cooking. It sticks to your ribs and will keep you full. We’re definitely going with a 4.5 out of 5 stars here, which is as high as I could go for a buffet. Dienner’s is located at 2855 Highway East in Ronks, Pennsylvania. Previous Post November is Travel Month!